Status: offline Sorry for asking a question about this again, but I have searched the Steam and these forums and read many threads about supply and railroad repair and I still haven't found an answer to what is happening here. What I see is all of my repair units for my FBDs sitting in hexes just outside the damaged rail area, doing nothing. I move the FBDs close or far away, doesn't matter, those units just sit in those hexes. I returned them all to their HQs and in the next turn they were all back in the same place. Since I just had my 10th post and Matrix isn't done testing my DNA sample, I can't post a pic of it, or even a link to it. But I've asked a similar question in the Steam forum and haven't received an answer. I'm kind of stuck on my current game as I've hit a point where if the rail isn't repaired real soon now, this whole invasion idea is going to faceplant. Status: offline The FBDs repair the hexes you want, you put in on a damaged axis hex(press R) and click the button in the right to repair the rail. This is the surgical and strategic repair of rail hexes which have a huge effect on a campaign depending where you repair and how you plan it. What you're seeing popping on the map are repair batallions which repair slower, they do the auxiliary repairs and are automated. A common thing to do is to put the RHG armies full of these construction batallions and put them where you want these auxiliary repairs. Not sure about the exact workings of the battalions or how many can be put out by a single army though. The FBDs repair the hexes you want, you put in on a damaged axis hex(press R) and click the button in the right to repair the rail. This is the surgical and strategic repair of rail hexes which have a huge effect on a campaign depending where you repair and how you plan it. Ok I might have requested you mention that the "button" is text that just changes color that's called RRC. Of course. But you SAVED ME. I now have FBDs doing something. I think what is happening is that the FBD converts the rail gauge to narrow German, and the construction battalions... tidy it up? Not sure but clearly there's a two-step process. I thought I had, apologies if I missed these things, I will go look again. Thanks to both of you for getting me on the right... track. Yes, I said it, I had no options. Status: offline FBDs repair up to 99 of 100 possible damage, the last point is repaired during logistics phase. Status: offline I've read that manual section and it's still not clear to me. As far as I can see, my participation in the repair of railroads cosnsists of using the RRC button on the FBD to repair specific hexes. IT seems to imply other units within the RRV range of the FBD will also repair hexes but if so I haven't seen them doing it yet. The continue to sit on their hands outside the areas in need of repair. Status: offline Trick in this method (which I have yet to master) is to keep Corps HQ and the AGs' RHG HQ with three or four attached construction units close to the sections you want to repair (5 hexes for Corps HQ, ? hexes for the RHG). Not sure if the HQ itself needs to be on a rail hex. You also may be able to accomplish what the manual implies by attaching/assigning additional (excess) construction units to the FBD you want to detail additional automatic repair units. Status: online if I understand rightly vossiewulf is still trying to do the vanilla FBD manual rail repair. If so best to keep it simple and not think about the other automatic rail repairs. RRV is not a range, it is a value like movement points. You need to move the FBD to the next damaged rail hex, press repair, and you will see those values go down. Keep moving to another hex and when they get too low you cannot repair anymore that turn. Might be easiest to watch one of the walk through videos to see it being done - for instance MarauderPl on youtube? Status: offline No, I am successfully repairing rail with the FBDs. I'm just not seeing all the construction battalions doing anything but sitting around, or mostly. For some reason where Armee Gruppe Nord is, there are a bunch of construction battalions looking like they're repairing things. Mitte and Sud remain with them sitting around looking stupid. I've never seen that. What I see is construction units appearing on the map one hex outside the damaged zone and just sitting there. Hey, I forgot @VPaulus freed me and I can post pics! I just realized, maybe that's what they look like? Stacks moving along the rail lines? And they're not operating maybe because the army group HQ is too far away? Also what do RHG HQs have to do with it? I thought they just controlled the security units that I've mostly been using to clear enemy hexes on the map. Status: offline Ahh. Original game art for the rail network is more helpful than the mod. The mod seems to have only two views - repaired (no track symbol) and unrepaired (yellow track). Original art for rail net displays status avatars as red (100% damaged), amber (under repair/partially damaged), and green. Also contains a mouse-over tooltip for amber status that displays damage percentage while the hex is undergoing repairs. Try mousing over any of the rail repair stacks. 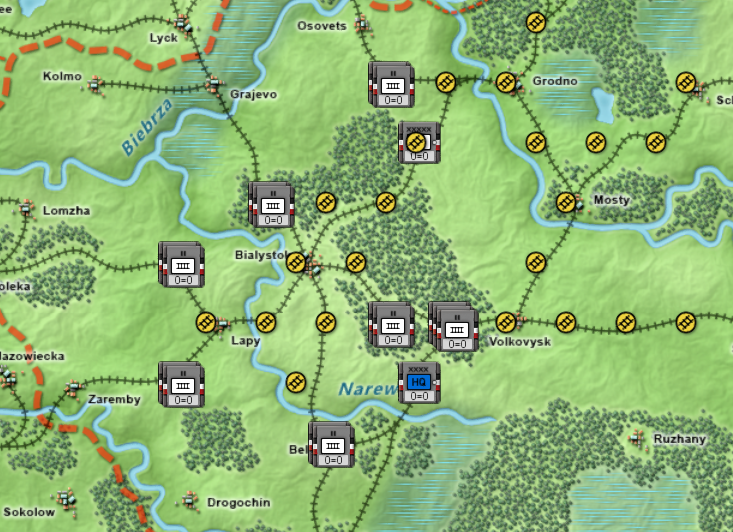 Right click on the repair units repairing hexes closest to 4th Armee HQ. Most may be construction units attached to this HQ. Status: offline I think that's the case, at least for the construction units. I watched several this last turn, they are repairing hexes, they're just not showing that they are, it goes from the rail marker to repaired and each turn it's sitting on the hex it just fixed, or it's fixing the one it's sitting on but nothing is showing. Thanks for all the help everyone, hopefully I am on track with this now.